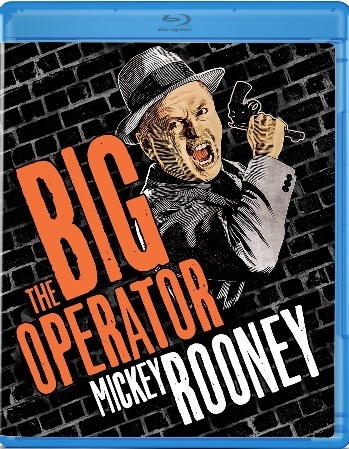 Officials with Olive Films announced this week that the classic cinema company will release Mickey Rooney’s 1959 crime thriller The Big Operator on DVD and Blu-ray this fall. Olive Films will release The Big Operator on DVD and Blu-ray Tuesday, September 16th. The late actor, who was best known for his role as Andy Hardy in the Andy Hardy films, stars in this crime thriller as Little Joe Braun. Braun is a union boss who is the most crooked figure since Johnny Friendly in On The Waterfront. He is trying to get out of a federal corruption probe. And only two men can stop him—factory workers Fred MacAfee (Mel Torme—Night Court) and Bill Gibson (Steve Cochran—Private Hell 36). This movie was an attempt by Rooney to escape the shadow of his Andy Hardy figure and show that he could successfully play a more mature, grown up figure. It mixes classic film noir style film making with an A-List cast that includes the likes of Mamie Van Doren (High School Confidential), Vampira (Plan 9 From Outer Space), Jim Backus (Gilligan’s Island, Mr. Magoo), and Jackie Coogan (The Addams Family) for a film that has earned the title of being one of the best B-flicks ever made. The Big Operator will retail for SRP of $29.95 on Blu-ray and $24.95 on DVD. More information on this and other releases from Olive Films is available online at http://www.facebook.com/olivefilms and http://www.olivefilms.com. To keep up with the latest sports and entertainment news and reviews, go online to http://www.facebook.com/philspicks and “Like” it. Fans can always keep up with the latest sports and entertainment news and reviews in the Phil’s Picks blog at https://philspicks.wordpress.com.